A Task is a prompt or reminder for someone on your team to perform a non-automated action such as a phone call to a lead, sending personal gifts to clients, reviewing applications for approval or a reminder to follow-up with a team member. Tasks are created in the Messages collection, as an "assign a task" action element in a Campaign or directly in a Contact's record. The Task appears in the Contact Record and in the Tasks collection where you can sort Tasks based on assignee and other criteria. Task Outcomes can be selected by your team member to trigger an automated response. They help manage what happens next after a task is completed. 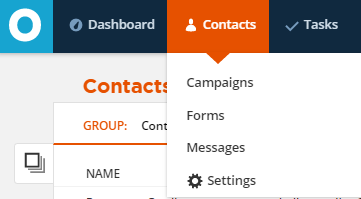 You can have the Task Outcome act on the Contact Record to send an email to the Contact, change the value of a field, add a Tag, subscribe the Contact to a Campaign and much more. Interested, but needs more time - This Outcome adds the Contact to a series of "Biz Builder Prospect Follow Up" actions. Not interested - This Outcome adds a Tag named "Biz Builder: not interested" to the Contact and removes them from any "Biz Builder" actions. Left a message/No Answer - This Outcome adds the Contact to another Task for a follow up call the next week. No further action - ONTRAPORT requires a Task Outcome to be selected. You can select the no outcome options. Create new Tasks on the fly from within Campaigns or the contact record of a particular contact. Task templates live in the collection. Go to the Campaigns collection. Create a new Campaign or edit an existing one. 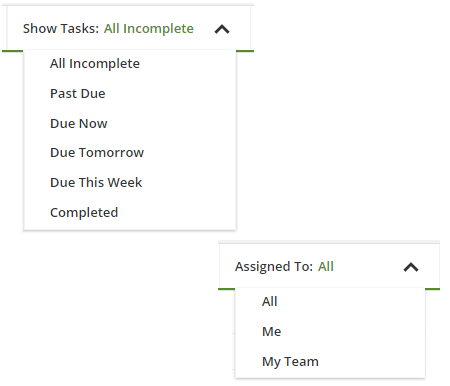 Add an Assign a Task element where you'd like the Task to happen. Enter the Task Subject. This appears in the Subject line in the Task notification emails. You may also use merge fields into the Task subject so your staff can see the merged information easily. To do this, see step 7 and copy/paste the merge fields into the Task subject. Designate a Due Date for the Task to be completed X days after it is assigned. Type out your Task instructions in the message body. Merge fields will populate with the Contact's information so your task assignee does not have to log in and open the Contact Record. Insert merge fields such as First Name, Last Name, Email, and Office Phone or any other merge fields necessary. Select to whom, when, and how the task notification will be sent. Task notifications can be sent via Email or an SMS. Selecting SMS will send to the user's sms number as entered in their personal profile. 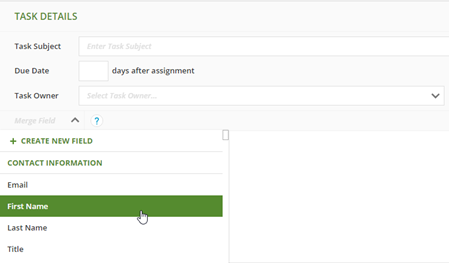 You can send a notification to the Task Assignee using "When Task is Assigned" unless you prefer that the assignee log in to ONTRAPORT in order to view their tasks. Notifications are also useful if you want a supervisor to be notified if a task isn't completed by a team member. Add an additional notification. Under Who, select Task Assignee's manager, enter the number of days for when you want to be notified and select after task is due for the how. In the example below, the task assignee's manager will be alerted 3 days after the task is due if the Task is not completed. Optional: Set Task Outcomes. If you'd like to allow more automation to manage what happens next for various situations once a Task is completed (e.g. send an email after a left message), this is a great way to accomplish it. 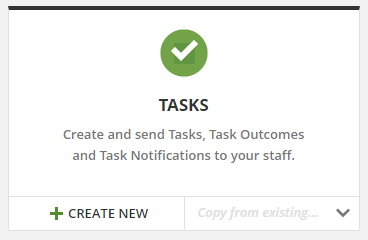 Click the + Add button in the Task Outcomes section. Select + Create new outcome to create an outcome name (e.g. approved, not approved, left message, not interested, etc). Click Save when the new outcome name is created. Add as many task outcomes names as you need for this particular Task. The Task outcome names will display below. Optional: select a form to be filled out on task completion (optional). 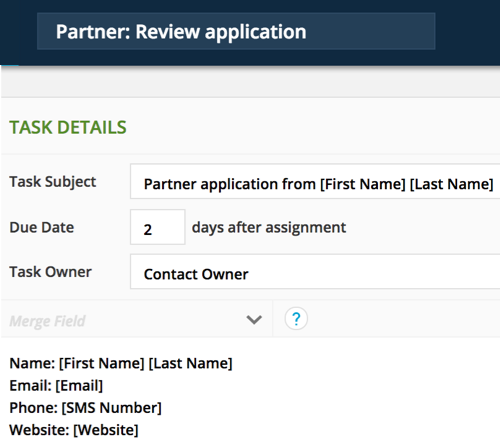 The form can update the Contact Record without your task assignee logging into ONTRAPORT. The form used will be a Legacy Smart Form. Save the Task and return to the Campaign. Enter the Task Subject. This appears in the Subject line in the Task notification emails. Type out your Task instructions in the message body. Merge fields will populate with the Contact's information so your task assignee does not have to log in and open the Contact Record. Insert merge fields such as First Name, Last Name, Email, and Office Phone or any other merge field necessary. Click Save when the new outcome name is created. Add as many task outcomes names as you need for this particular Task. From here you can create a Campaign to fire a Task at the appropriate time in your business process. Add automation for what you want to happen after a task is completed by using a Trigger, Goal or Condition. In this usecase, once the task to call a new customer is completed, we will send a "thanks for your time" email to a new customer. This example does not use Task Outcomes. You'll find that detailed information in the section below. Press the + Add Goal button and select Task is Completed. Who can achieve this goal? A common setting for this usecase is any contact on this map. If Contact is already on map, then? A common setting for this usecase is move here when achieved. Below the Goal Save the Task and return to the Campaign, add a send an email action element. Use the pulldown to select the email you'd like to send after the Task is completed. If the email isn't already created, select +create new email. For more information on how to create an email, please see this article. There are different ways to add automation. We recommend using Goals for your Task Outcomes so you can gauge Task Performance. 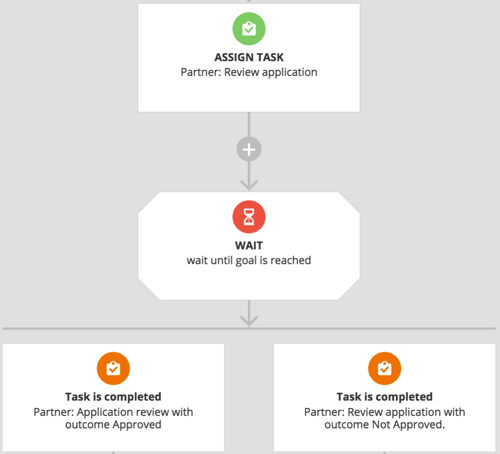 Below is an example of how to add automation for 2 Task Outcomes for a partner application review process. Below the assign a Task outcome, add a Goal element. Press the + Add Goal button and select Task is Completed. Select the Task you'd like to use for your Task outcome build. 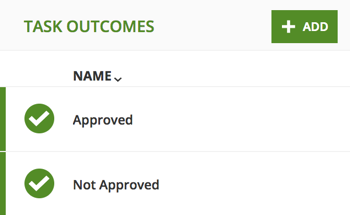 Use the "is completed with outcome" pulldown menu to select your first outcome. If Contact is already on map, then... a common setting for this usecase is move here when achieved. Add one Goal per Task outcome adjacent to the Goal created in step 2-3. Add your desired actions below each Goal. Below is a simple example that could be built. 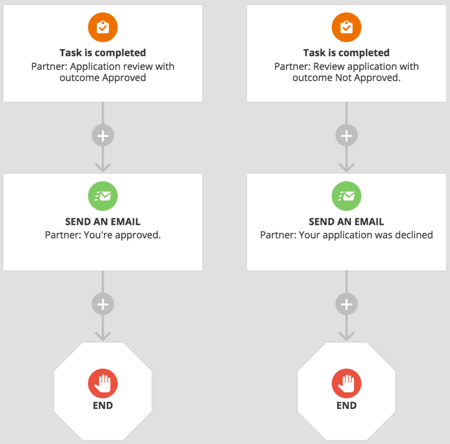 Approved Task outcome: After the initial application review task is completed and the task outcome is set to approved, an email is sent to the Partner letting them know their application was approved. Not Approved Task outcome: After the After the initial application review task is completed and the task outcome is set to not approved, an email is sent to the Partner letting them know their application was denied. Once you’ve created a Task, you can set it to trigger automatically for your Contacts from a number of places in ONTRAPORT. Recommended - Campaigns: Insert an Assign a Task element in your Campaign wherever you want to trigger this action. Not Recommended - Advanced Global Rules: Create a Rule that automatically triggers a Task whenever a contact performs any action that you specify. Not Recommended - Legacy Sequences: Add a Task Step to a Sequence that triggers a Task for any Contact who is added to that Sequence. Not Recommended - Legacy Smart Forms Rules: Add a Rule to your Smart Form that triggers a Task for any Contact who fills it out. Note: Advanced Global Rules, Legacy Sequences and Smart Form Rules apply to ONTRAPORT Pro and above. From a task notification email/sms. 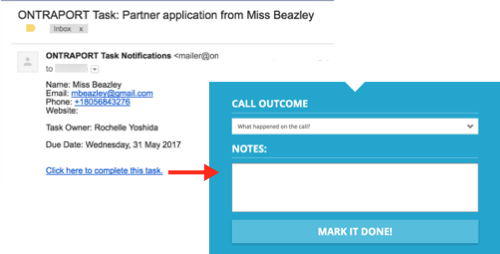 Once received, click on the "Click here to complete this task" link at the bottom of the email notification and a webpage will appear where you can select the call outcome, enter notes and mark the task complete specific to that contact. In an individual contact record under the Notes and Tasks tab, inside the Task Manager section. Show Tasks drop down - display tasks by due date. Hide all of the completed tasks by selecting All Incomplete. Create groups - by clicking the Manage Groups button, you can create groups of tasks based on a number of criteria such as assignee, outcome, status, and more for ideal organization. where do you edit the task outcomes? Task DUE DATE question: when it says X Days after Assignment: is the Date we are ADDING the Task to the Contact Record considered to be the Assignment Date?? FYI: This is rather confusing, and it would be MUCH more helpful to have a calendar option from which to actually CHOOSE the ACTUAL DUE DATTE. Thank you. How do I edit a task template that was created in a Rule?